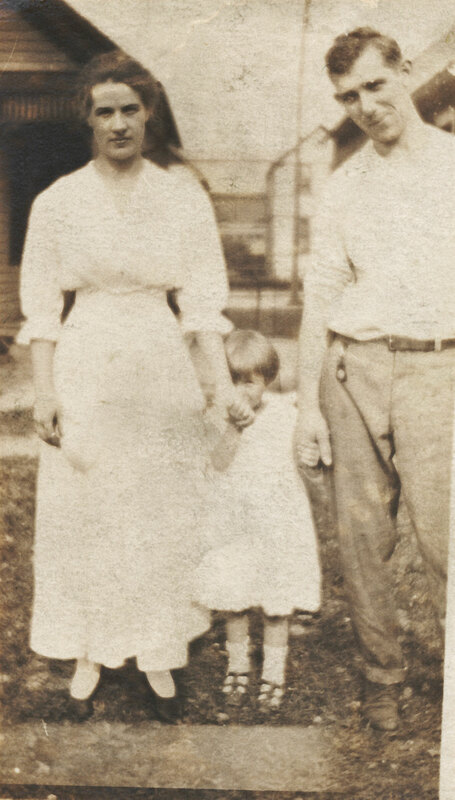 The following year, on 23 Jun 1901, George was baptized in the Columbia Township Methodist Episcopal Church by Rev. George L. Hanawalt. Times were hard and the family was extremely poor. Stories passed down through the family says that George's parents were so poor that they were unable to provide for all their children. It's said they were sent out of the house at a young age to find work. George was said to have left home around the age of 12 to find a job and potentially provide for himself. Before this time, George had never owned a pair of shoes. George told his grandchildren that to start out their relationship, Mr. Mueller bought George his first pair of shoes. It's also believed that the original terms of George's employment weren't as much for a paycheck as it was working for room & boardA. 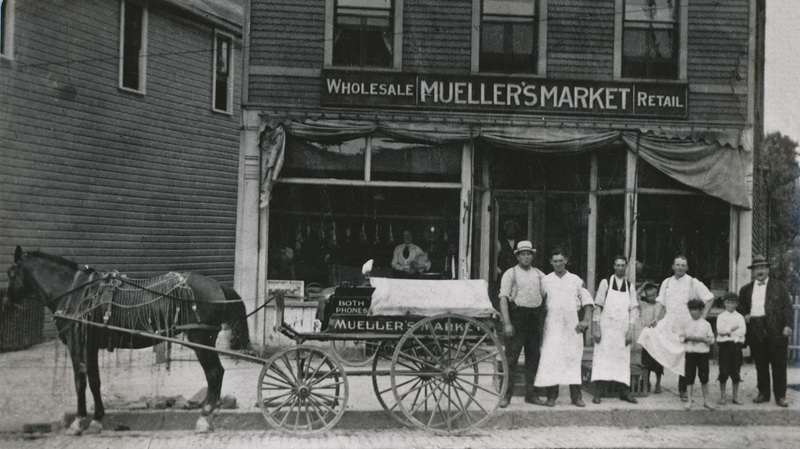 From this point on, Mr. Mueller became not only a boss for George, but as much of, if not more of a father to George than that of his own father. 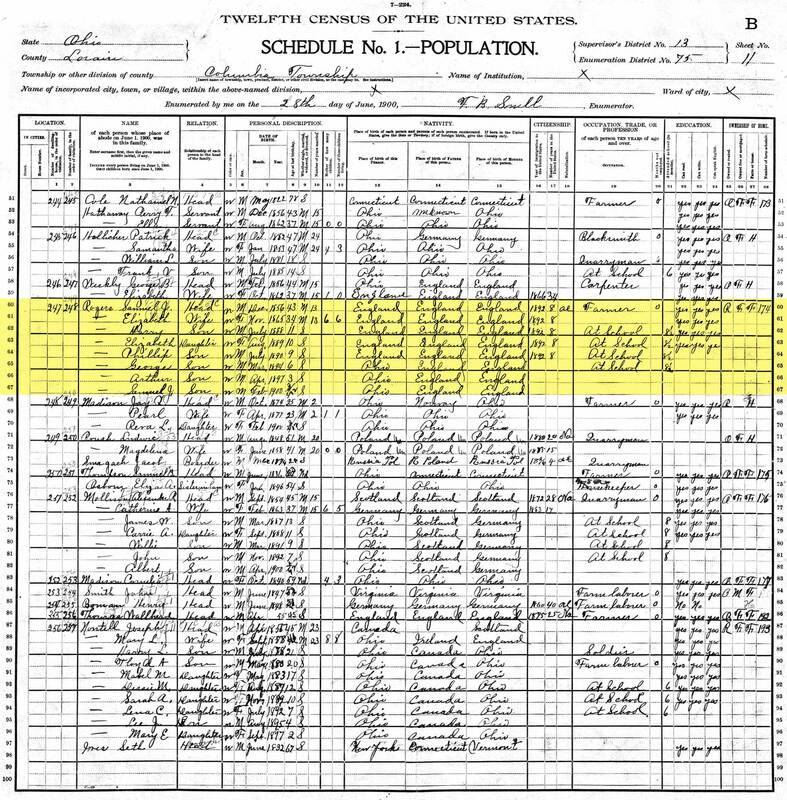 George seems to be missing from the 1910 census. He would most certainly be living in Cleveland now that he's employed by Mr. Mueller at the meat market. He's probably living with Mr. Mueller at this time since he is only 15 years old, but wasn't counted for one reason or another. It's also possible he was already living above the butcher shop, but was somehow skipped over. The family belief was he was provided residence above the butcher shop from day one. 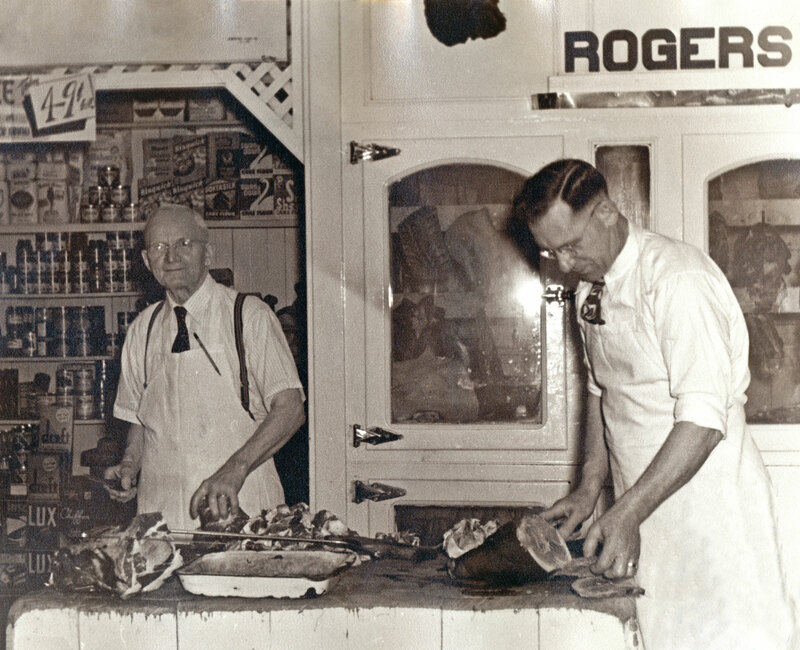 Sometime around 1943 George would take all that money he saved working for Mr. Mueller, buy out his partner and officially purchase the butcher shop, changing the name to Rogers Foods.13 George would continue the partnership with Mr. Mueller keep him on as an employee until he was ready to officially retire. 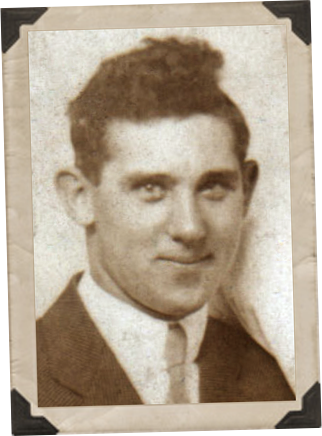 In mid-late June of 1942, Georgie (Jr), now 20, ran away from home and against his family's wishes, joined the Army on 22 Jun 1942 at Fort Benjamin in Harrison, Indiana.14 This greatly upset the family because, as member of the "food service industry", George and Georgie (Jr) were both exempt from the draft and neither were required to serve their country. The government determined that their efforts were better served at home, providing the service his family supplied to the public. The Butcher Shop (1942)Georgie was assigned to the 91st Calvary Recon Squadron, an infantry division of the Army.15 Here he saw action in Africa and was part of the capture and occupation of Rome, Italy where he was wounded on the 10 Jan 1944.16 After Georgie's recovery he again went back into service. 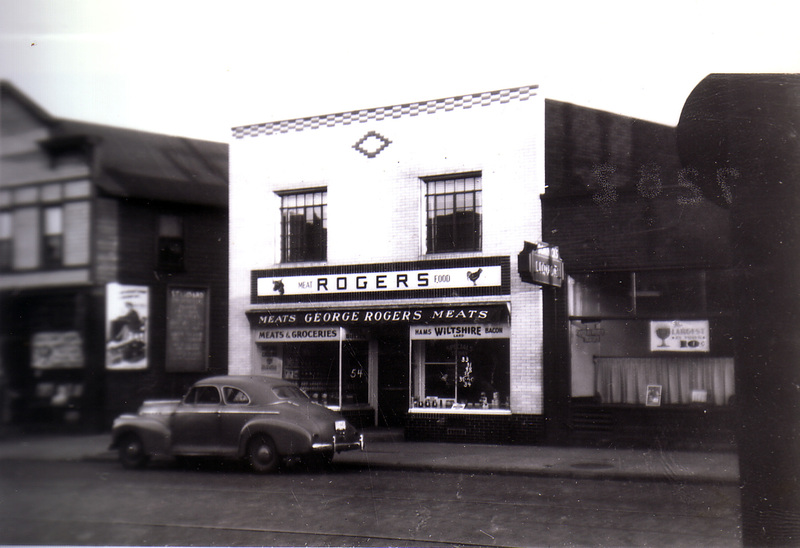 The news of Georgie's death nearly destroyed the Rogers family. 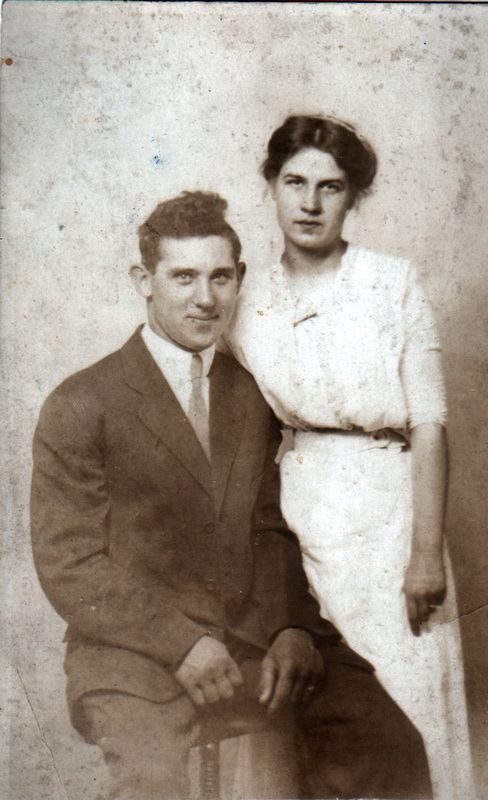 George and Elna went into deep depression and were unable to do much of anything except mourn the loss of their son. 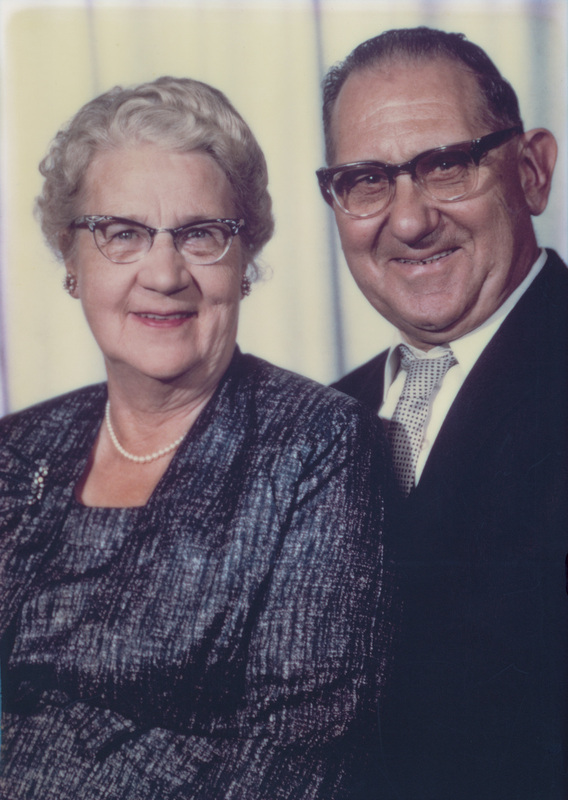 If it weren't for the efforts of their daughter Edna and her husband Ralph Schnell, the family would have lost the butcher shop. Ralph quit his job as a chicken farmer and with Edna's help, the two of them took over the business' day to day operations. George and Mr. Mueller at the Butcher ShopThe affects of Georgie's death got so bad that Ralph and Edna thought the two would never recover. They made plans and started construction on a pair of houses, side-by-side, sharing a single driveway at 19608 & 19610 Westwood Drive in Strongsville, Ohio. This was to be where George and Elna could move to and be cared for by Ralph and Edna. 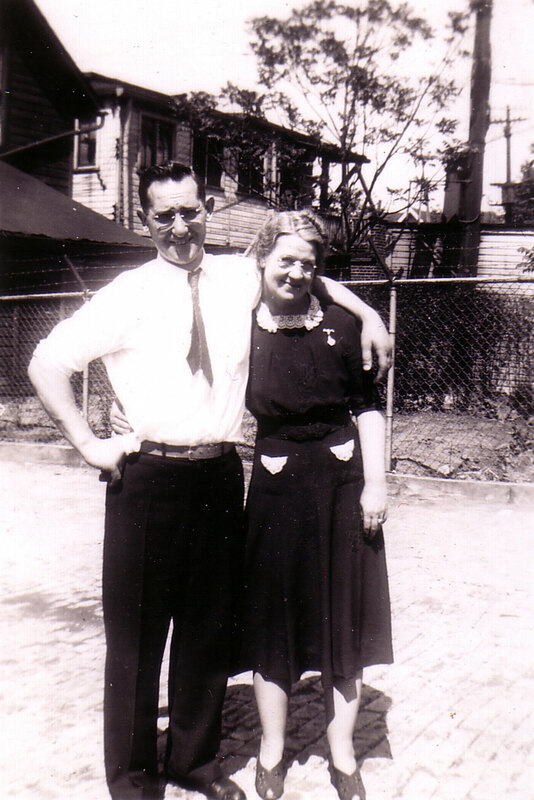 After the family got back on their feet again, George and Elna returned to working and living above the butcher shop. 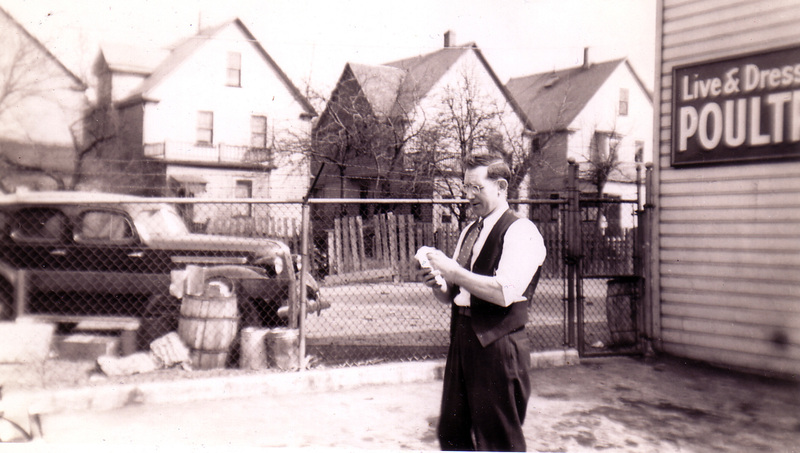 He worked here with his family the rest of his life, even raising his grandchildren and great grandchildren in the butcher shop. 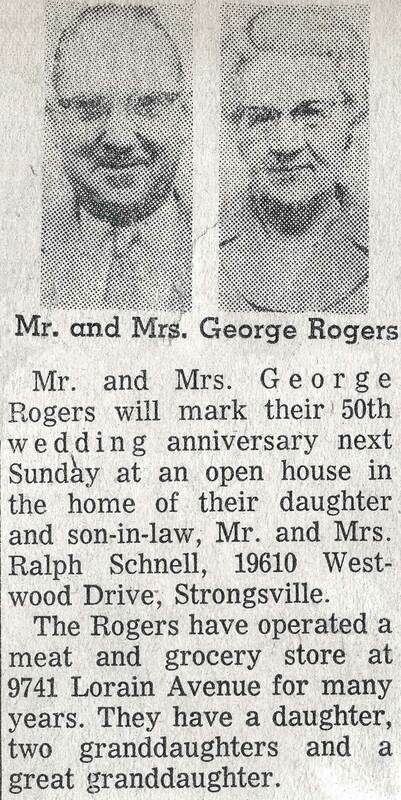 George and Edna never moved to Strongsville. In George's later years, the maintenance on all the properties he owned became too much for him to handle all by himself. 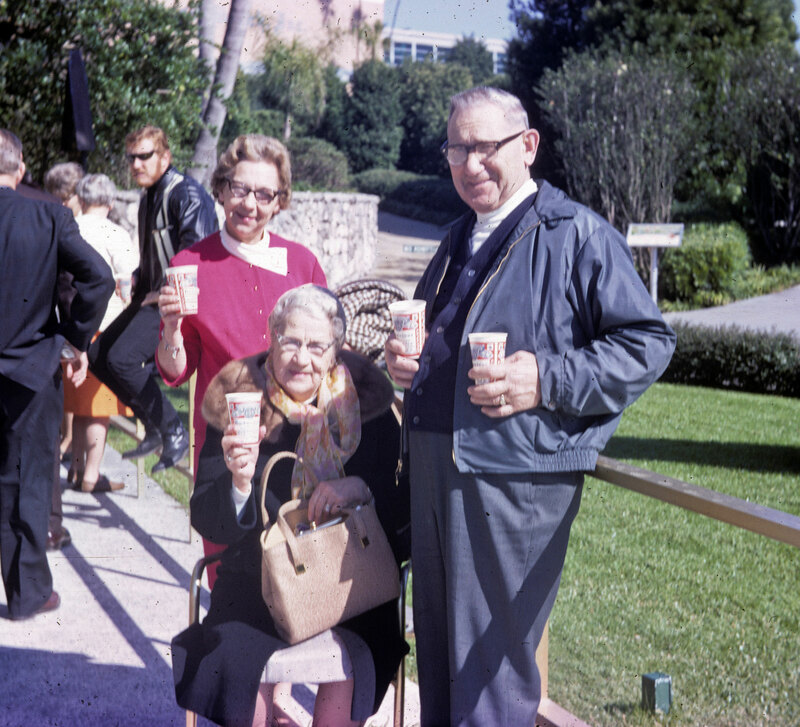 George would eventually pass landlord responsibilities onto his son-in-law Ralph Schnell and they stayed in the family until the late 80's when they were sold off. By this time the neighborhoods were becoming less than desirable and the homes were of the age where there was always something that was broken or breaking. 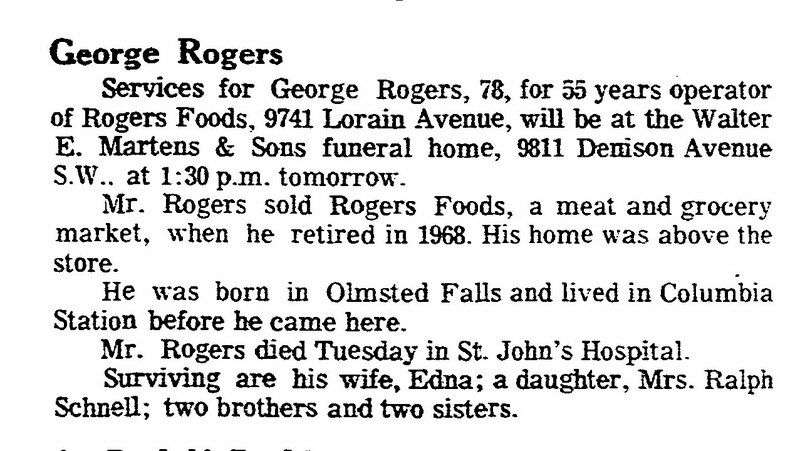 George sold Rogers' Foods in 1968, retiring after 55 years as operator according to his obituary (a newspaper noting his hire at the butcher shop marks retirement after 58 years in business).2 After retirement George kept ownership of the building and rented out the storefront to another business. At one point the place even became the home of a florist. George and Edna continued to live above "the butcher shop" and stayed there the rest of George's life. A This is further evidence that supports the assupmtion that George was sent out (read: kicked) of the house at a young age to provide for and shelter himself. B Edna Greshauge was born Elna Wilhelmina Mortensen. Even though Elna was know for the majority of her life as Edna Greshauge, I will continue to refer to her throughout as ELNA so as not to create any confusion between her and her daughter who was named Edna by birth. So if Elna is stated, it's the mother Edna Wilhelmina, if Edna is stated, its the daughter Edna Marie. 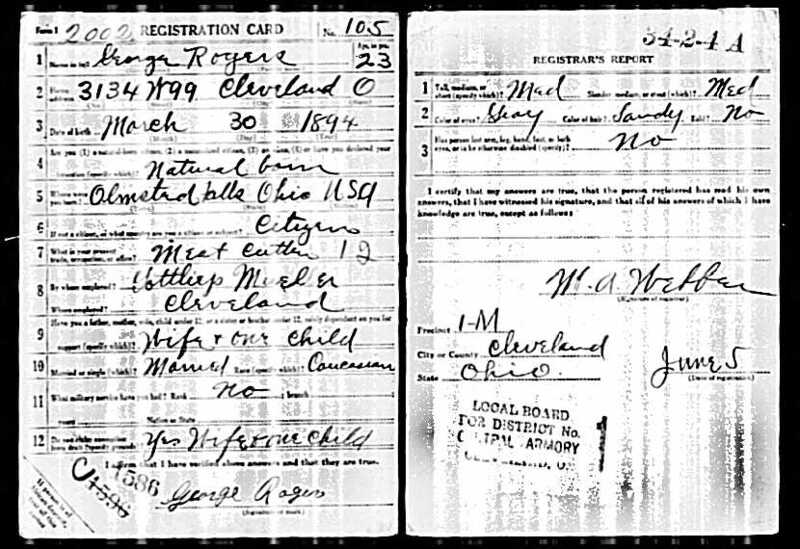 1 U.S., World War I Draft Registration Cards, 1917-1918 about George Rogers; Registration State: Ohio; Registration County: Cuyahoga; Roll: 1411594; Draft Board: 1. 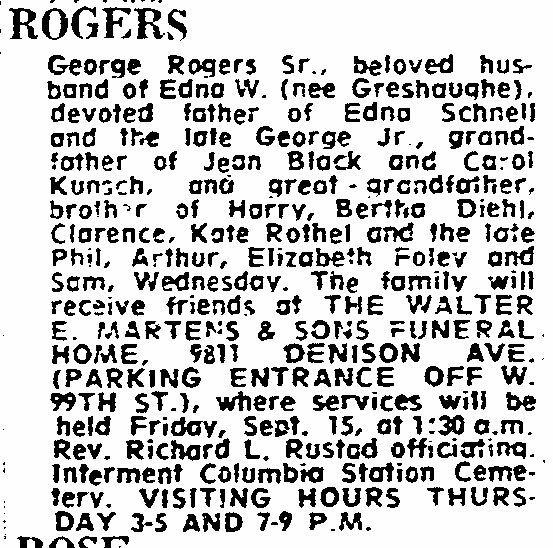 2 Obituary for George Rogers; The Cleveland Plain Dealer Newspaper; Thursday, 14 Sep 1972; pg. 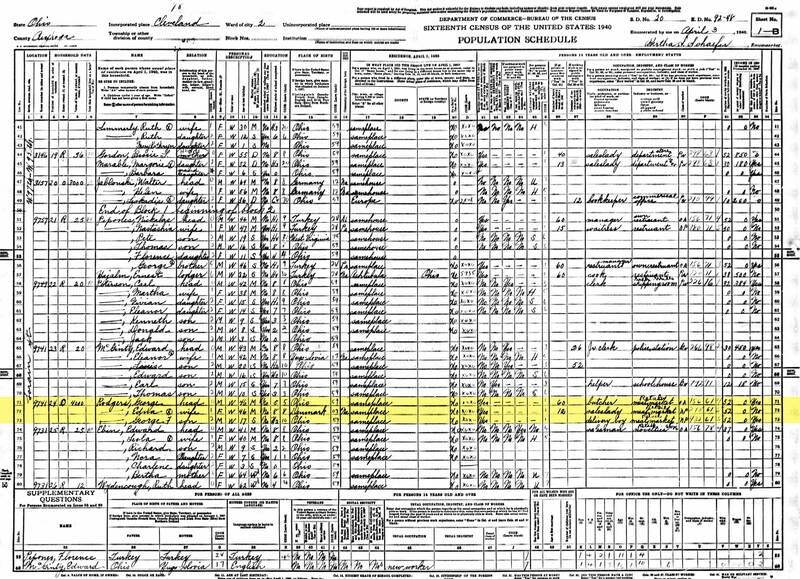 9-G.
3 1900 United States Federal Census about George Rogers; Year: 1900; Census Place: Columbia, Lorain, Ohio; Roll: 1294; Page: 11B; Enumeration District: 0075; FHL microfilm: 1241295. 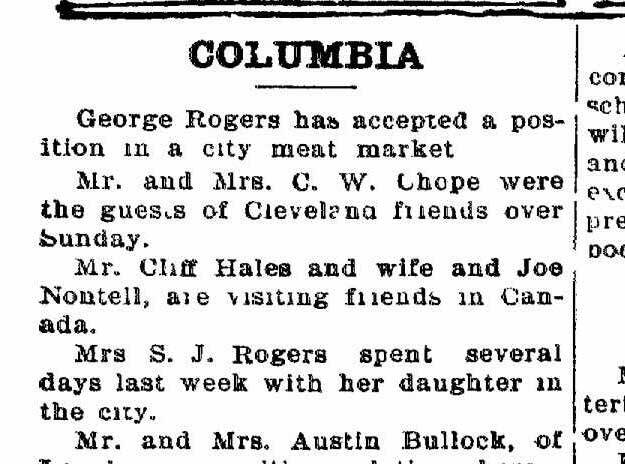 4 News of Lorain County: Columbia; The Elyria Republican Newspaper; Thursday, 13 Jan 1910; pg. 3. 5 Cuyahoga County, Ohio, Marriage Records and Indexes, 1810-1973 about Edna Greeshauge and George Rogers; Cuyahoga County Archive; Cleveland, Ohio; Cuyahoga County, Ohio, Marriage Records, 1810-1973; Volume: Vol 84-85; Page: 319; Year Range: 1913 Mar - 1913 Sep.
6 Ohio, Deaths, 1908-1932, 1938-2007 about Edna Marie Schnell; Certificate: 74478; Volume: 35456. Ohio. Division of Vital Statistics. State Archives Series 3094. Ohio Historical Society, Ohio. 7 Cleveland City Directory 1914-1915 about George Rogers; Cleveland, Cuyahoga, Ohio; Cleveland Public Library, History Department. Cuyahoga County, Ohio; Identifier: F499.C6 A17X 1914-15; Published: Cleveland Directory Co., 1914; Printed volume, 2271 pages; Page: 1355. 8 Cleveland City Directory 1921-1922 about George Rogers; Cleveland, Cuyahoga, Ohio; Cleveland Public Library, History Department. Cuyahoga County, Ohio; Identifier: F499.C6 A17X 1921; Published: Cleveland Directory Co., 1921; Printed volume, 3304 pages; Page: 2284. 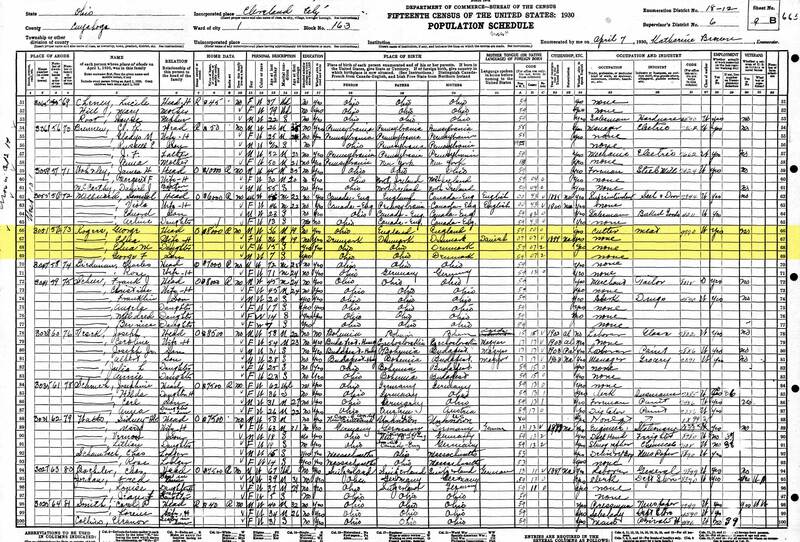 9 1920 United States Federal Census about George Rogers; Year: 1920; Census Place: Cleveland Ward 1, Cuyahoga, Ohio; Roll: T625_1359; Page: 24A; Enumeration District: 8; Image: 958. 10 1930 United States Federal Census about George Rogers; Year: 1930; Census Place: Cleveland, Cuyahoga, Ohio; Roll: 1762; Page: 9B; Enumeration District: 0012; Image: 524.0; FHL microfilm: 2341496. 11 Cleveland City Directory 1934 about George Rogers; Cleveland, Cuyahoga, Ohio; Cleveland Public Library, History Department. 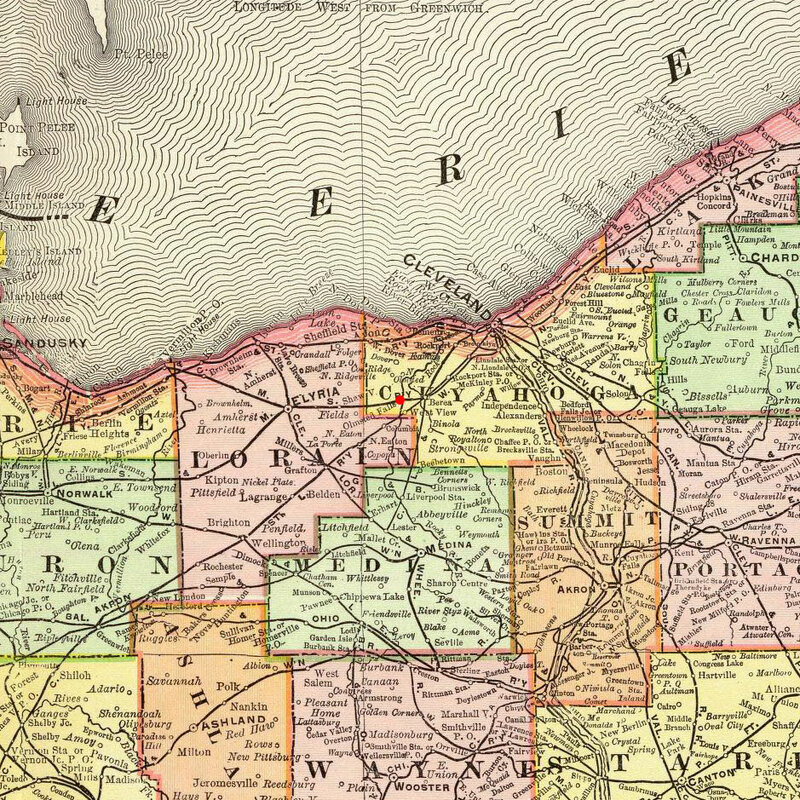 Cuyahoga County, Ohio; Identifier: F499.C6 A17X 1934; Published: Cleveland Directory Co., 1934; Printed volume. 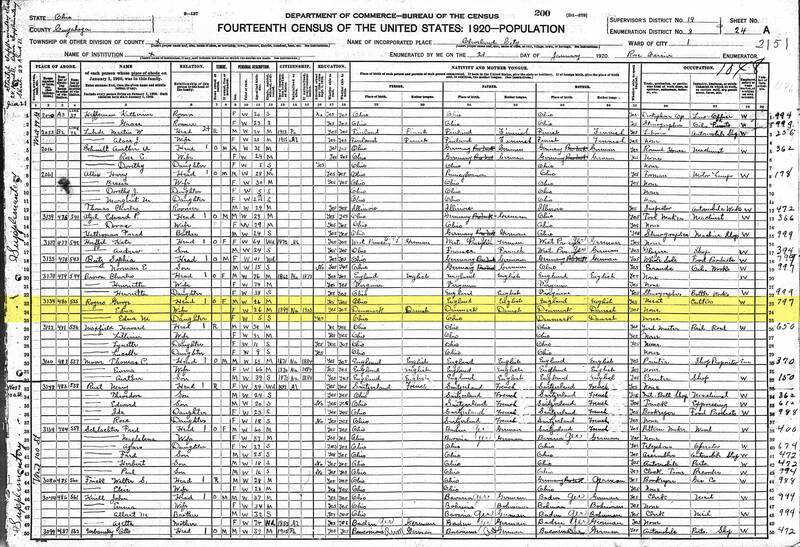 12 1940 United States Federal Census about George Rogers; Year: 1940; Census Place: Cleveland, Cuyahoga, Ohio; Roll: T627_3204; Page: 1B; Enumeration District: 92-48. 13 Cleveland City Directory 1946 about George Rogers; Cleveland, Cuyahoga, Ohio; Cleveland Public Library, History Department. Cuyahoga County, Ohio; Identifier: F499.C6 A17X 1946; Published: Cleveland Directory Co., 1946; Printed volume. 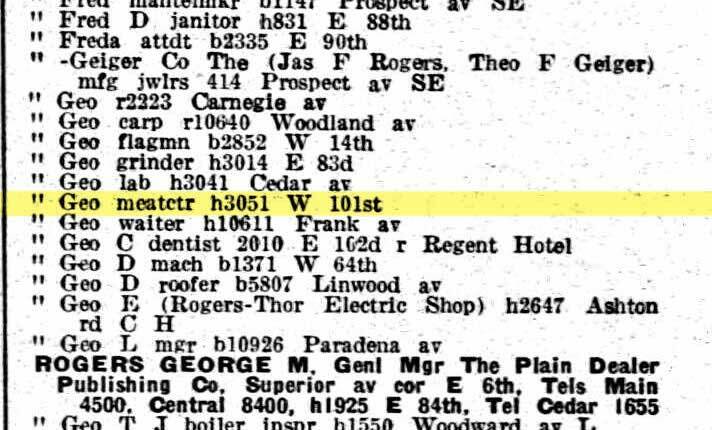 14 U.S. World War II Army Enlistment Records, 1938-1946 about George F Rogers of Cleveland, Ohio; Electronic Army Serial Number Merged File, 1938-1946 [Archival Database]; ARC: 1263923. World War II Army Enlistment Records; Records of the National Archives and Records Administration, Record Group 64; National Archives at College Park. College Park, Maryland, U.S.A.
15 Gravestone of Cpl. George Frederick Rogers Jr., Columbia Center Cemetery, Columbia Station, Lorain, Ohio. 16 Wounded in Action Notice for PFC. George F. Rogers Jr.; The Cleveland Plain Dealer Newspaper; Saturday, 26 Feb 1944; pg. 9; Section: Wounded. 17 War Department Details Georgie's Death; Correspondence from Robert H. Dunlop, Brigadier General at the War Department, Adjutant General's Office, Washington 25, DC to Mrs. Edna Rogers 9741 Lorain Ave., Cleveland, OH; 2 November 1944; Document held by Carol Straka, Niece of Georgie. 18 Army Service Forces of Temporary Burial, 1945; Correspondence from Mayo A. Darling, Lt. Colonel Q.M.C., Assistant at the Army Service Forces, Office of the Quartermaster General, Washington 25, DC to Mrs. Edna Rogers 9741 Lorain Ave., Cleveland, OH; 10 January 1945; Document held by Carol Straka, Niece of Georgie. 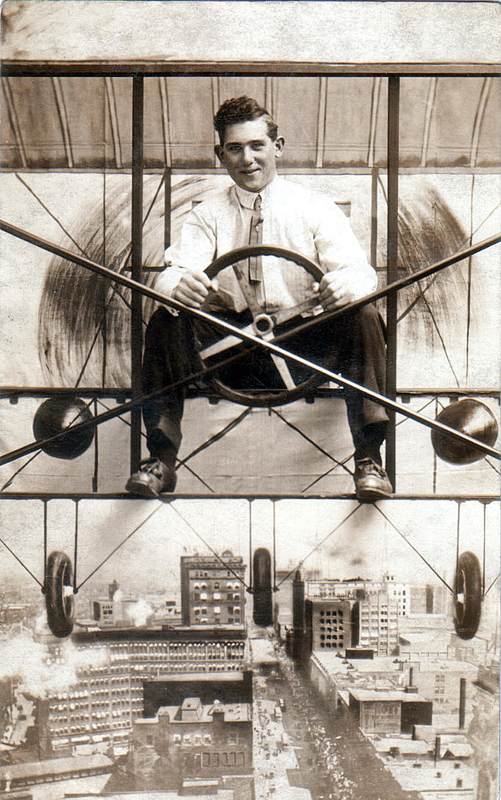 19 Ohio, Deaths, 1908-1932, 1938-2007 about George Rogers. Certificate: 067645; Volume: 21007. Ohio. Division of Vital Statistics. State Archives Series 3094. Ohio Historical Society, Ohio. 20 Death Notice for George Rogers, Sr.; The Cleveland Plain Dealer Newspaper; Thursday, 14 Sep 1972; pg 5-E.
21 U.S., Social Security Death Index, 1935-Current about George Rogers; Number: 288-30-8317; Issue State: Ohio; Issue Date: 1951-1952. 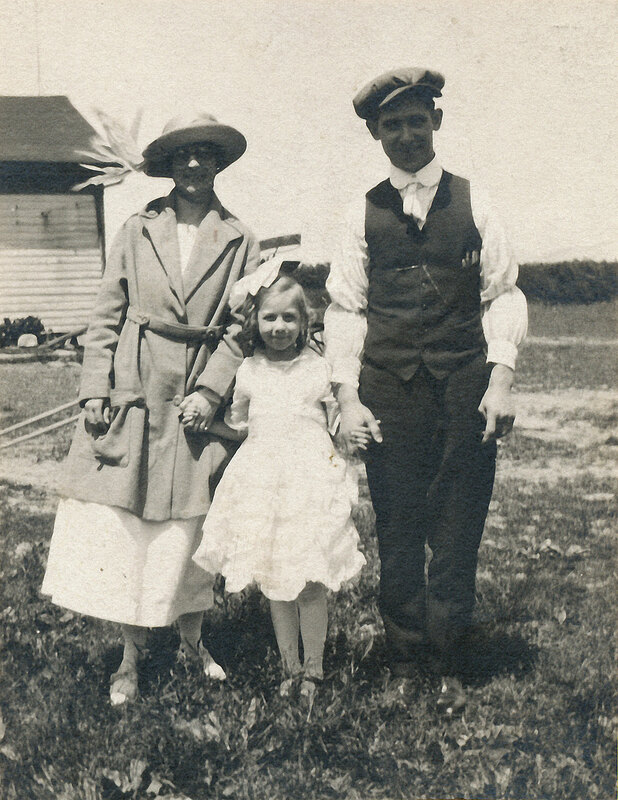 * Any information here that does not have a specific source provided for it came from conversations with my family, whether that was George & Edna’s grandchildren or my mother, a great grandchild, all of whom were raised in the butcher shop.